Here's an interesting piece of Jeep literature: an undated 36-page booklet titled Jeep Vehicles for Aircraft Ground Support . It dates from between 1957 and 1959, since it includes an FC-170 truck, and the Convair C-53D-DO on the cover left the United Airlines fleet in 1959. It's interesting that the operator seen in the cover photo is dressed like a pilot in his official hat, necktie and aviator sunglasses, although what he's doing is emptying the sewage from the aircraft's washrooms. Yes, the pride of the Jeep airport fleet, taking up the first third of this booklet, is the "Jeep Lavatory Truck." Since this was a dual tanker designed to carry 106 gallons of flush water and up to 210 gallons of refuse, it seems a bit surprising that it was built on the half-ton CJ-6 rather than the one-ton truck seen below. See a rear view of the Lavatory Truck (70K JPEG). The control tower in that photo reveals that the pictures were taken at Toledo Municipal Airport, and it's also a better view of the Convair Mainliner "Walla Walla", in service with United from 1954 until 1959 according to a fleet list. The second specialized vehicle included in the booklet is the "Jeep ADI Water Truck," which again is a dual tanker, designed to carry 235 gallons each of drinking water and Aircraft De-Ice, with hydraulic-powered pump motors. The chassis is the 1-ton Willys truck with Super Hurricane 6-cylinder engine. A rear view photo (80K JPEG) shows some of the plumbing and hoses, as well as the 8-foot aluminum ladder. The truck seen here carries a United Airlines logo on the door, but the location of the airport where the photos were taken is not apparent. The United DC-7 "City of Newark" was in service from 1954 until 1960 according to a fleet list. The CJ-3B and CJ-5 are included here as "baggage tractors," essentially stock vehicles with optional drawbar and pintle hook. The specifications for both models list a 6-volt battery as standard. Interestingly, the specs for the 3B also state that the "Shock absorbers are direct-acting, 2-way hydraulic control (Airplane Type)." 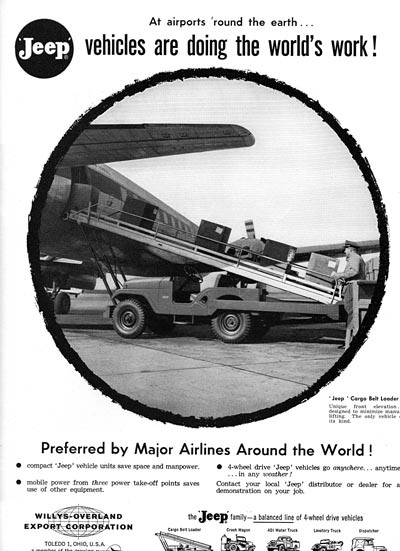 The aircraft seen behind a 3B pulling baggage carts for TWA is "Star of the Yellow Sea," an early Lockheed Constellation in service with TWA from 1947 until 1962 according to a fleet list. The Jeep Utility Delivery is recommended as a "message carrier, food carrier or service vehicle." The Trans-Canada Air Lines Jeep seen here has some distinctive features; a large grille guard, fire extinguisher on the fender step, side reflectors and a single side window in the rear cargo area. Jeep Vehicles for Aircraft Ground Support includes a different photo of a CJ-3B Crash Wagon than I've seen in other Willys publications. Comparing this with another 3B crash wagon photo (50K JPEG) in the booklet Jeep Vehicles in Public Service , it appears that the rear-mounted foam tank pivots forward to mix the soda and acid, activating the foam. A carbon dioxide cylinder is mounted across the body just behind the front seats. The third CJ-3B in the booklet is equipped with a snowplow, as an example of other available Jeep Special Equipment. Again this is a different photo than is seen in other Willys advertising, but it doesn't appear to have been taken at an airport. Jeeps equipped for baggage loading, as seen in Building Conveyor Belt CJ-3Bs, are not mentioned in Jeep Vehicles for Aircraft Ground Support . Possibly at the time of the booklet Willys Motors had no agreement with Phelps Mfg. to promote their Hogan Conveyors ("Hoveyors"), but a DJ-3A conveyor appears in this looseleaf catalogue sheet, which may date from a little later, considering the big jet added to the illustration. A CJ-3B belt loader is also among the airport vehicles pictured in the 1955 booklet Jeep Vehicles in Public Service . 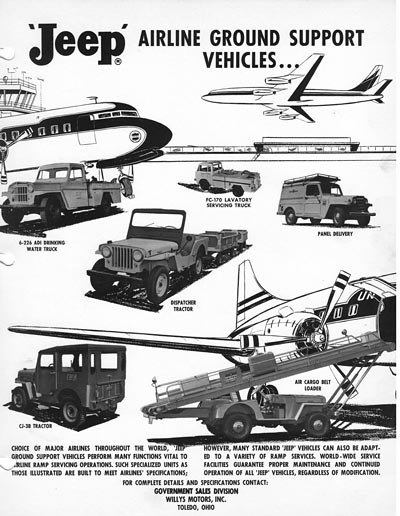 In this Willys-Overland Export Corp. advertisement circa 1957, the Hoveyor was promoted, and it was a CJ-5 version. The export divison of Willys Motors kept the old Willys-Overland name, and their job was to market Jeeps overseas. They were no doubt happy to show off the most recent Universal Jeep model, although the CJ-3B was probably a bigger part of their export business. I don't know how Phelps Mfg. decided what Jeep model to bring over from Toledo on a given day -- they used CJ-3Bs, DJ-3As and CJ-5s to build their Hoveyors. Maybe they just took whatever Willys was overstocked with at the time. 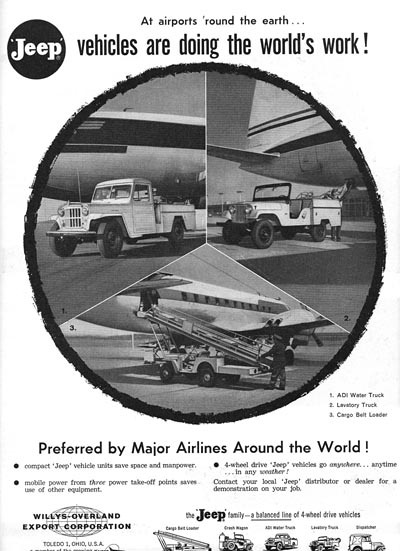 Another ad in the Willys-Overland Export Corp. series "At airports 'round the earth... Jeep vehicles are doing the world's work!" showed the Dispatcher DJ-3A belt loader, as well as the Water Truck and the Lavatory Truck. It would be interesting to know how many of those trucks were sold, after all the advertising. 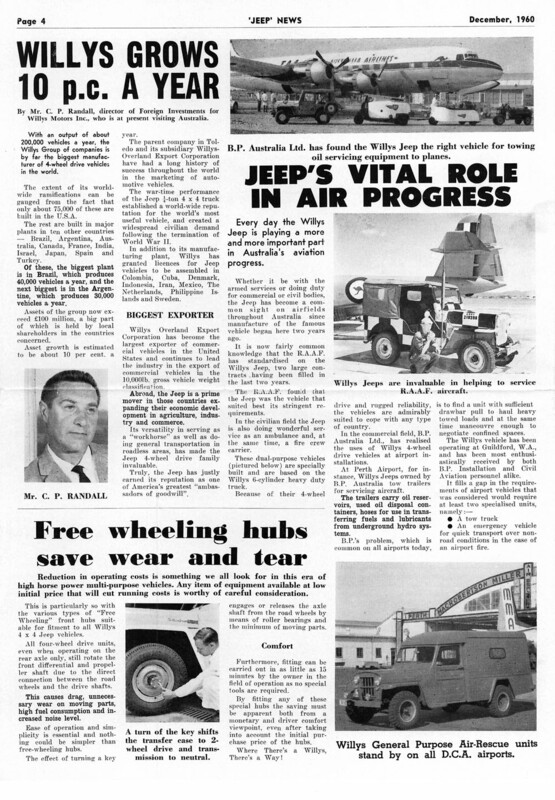 Willys Australia was a very active importer of Jeeps in this time period, and found that one of their local markets was airports. 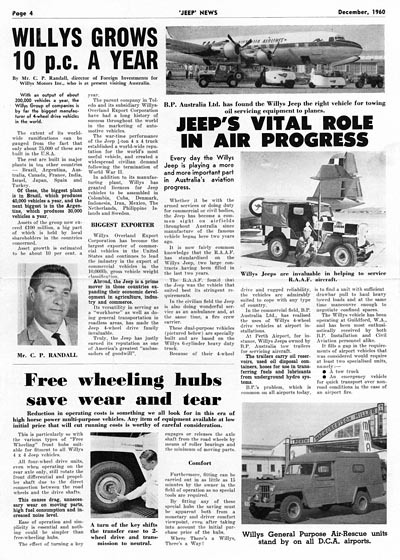 They published a feature in their promotional newspaper Jeep News in December 1960, describing the use of a CJ-3B to tow service trailers on the tarmac by B.P. Australia, who cited the combination of sufficient drawbar pull and maneuverability in confined spaces. Also on CJ3B.info, see action photos of Airport Ground Service Jeeps, and a history of Airfield Crash Rescue Jeeps. Return to CJ-3B Advertising and Literature.